Tolstoy wrote that happy families are all the same, but each unhappy family is dysfunctional in its own special way. I think wine cooperatives might be the opposite of Tolstoy’s families: the unhappy ones are all the same, but each happy one succeeds in a different way. Made when Alto Adige was Austrian. This is not a theory, only a working hypothesis (a.k.a. educated guess) based upon some recent fieldwork. We all know the story of unhappy cooperatives (which I summarized in my last post on Invisible Wineries), but what about the successes? Answering this question was one of my goals during our recent visit to Italy’s scenic Alto Adige wine region. If I describe the Alto Adige wine economy to you it will sound like a recipe for failure. The region is tiny in terms of wine, producing a total of only about 40 million bottles each year, which is less than one percent to Italy’s total output (and about 1/20th of Gallo’s annual output). Although I don’t have data on this, I am pretty sure that wine is not even the most important agricultural product in the region — I suspect that apples are #1. The vineyards are tiny and ownership is impossibly fragmented. Typical vineyards are a hectare; the top 100 account for only about 5 percent of the total. And, although popular international varieties are grown here, production is dominated by indigenous varieties such as Schiava (aka Vernatsch), Lagrein and Gewurtztraminer. Against all odds, the Alto Adige cooperatives are among the happy families of the wine world. Seventy percent of Alto Adige’s wine is produced by its 14 cooperative wineries. Although this wine varies in price and quality, of course, it must be said that the best of the cooperative wines rank among the best wines of their type in Italy and perhaps even the world and the cooperatives we visited were prospering. Thumbing through my copy of the 2007 Gambero Rosso guide to the wines of Italy, for example, I encounter a long list of cooperative wines with the highest “three glasses” ratings. Here’s a list of the cooperatives so honored: Cantina Calterenzio, Cantina San Michele Appiano, Cantina Convento Murie-Gries, Cantina Santa Maddelena/Bolzano, Cantina Viticoltori di Caldaro, Cantina Valle Isarco, Cantina Terlano, and Cantina Termeno/Tramin. Several others earn ratings nearly as high. These are my happy cooperative families. Why do cooperatives work here when they seem often to fail elsewhere in Italy and Europe? My very tentative conclusions (based on visits to three cooperatives — Cantina Santa Maddelena/Bolzano, Cantina Termeno/Tramin and Cantina Valle Isarco) can be sketched this way. On one hand, the cooperatives we visited avoided the key errors in institutional set up: they require that members bring all their grapes to the cooperative rather than allowing them to keep the best and dump the rest in the cooperative vats. And they carefully monitor member wine grower practices and grape quality. 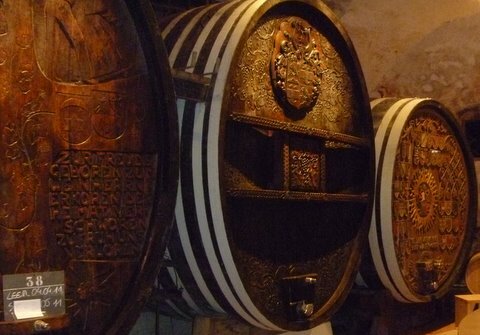 Many cooperatives are organized so that the collective cellar is the “buyer of last resort.” Members can keep the best grapes for their own production and dump the rest in the cooperative’s vat. 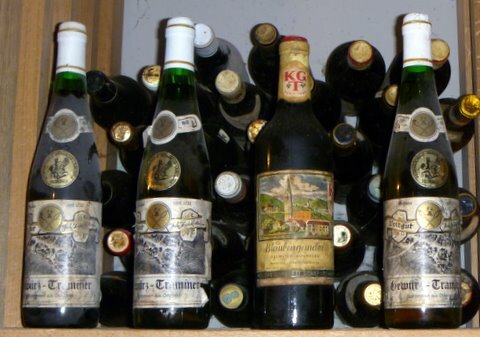 If coop members have a choice, they will keep the best grapes for themselves (putting private interest ahead of collective interest) and the result is that after a while only the worst grapes go to the cooperative and the wines necessarily suffer both in the bottle and in the marketplace. With no alternative but to sell all their grapes to the cooperative, however, Alto Adige vineyard owners have an interest in raising quality in both their own plots and those of other members. Getting the incentives right is clearly important, but this is often easier said than done. What happened to the Alto Adige cooperatives to cause them to adopt effective collective arrangements? I think the unique history of the Alto Adige wine region has something to do with it. Alto Adige has been a wine growing region for thousands of years. Production seems to have peaked around 1910 when nearly 10,000 hectares (25,0000 acres) of vines covered the region, which was then part of Austria. The local industry was devastated by the combination of World War I, the Treaty of Versailles (which transferred the territory from Austria to Italy) and then the Great Depression. 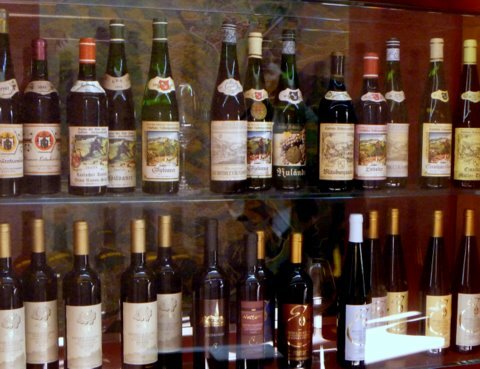 Alto Adige producers found that the couldn’t sell their wines in Italy (which still thought of them as the enemy) or in Austria or, well, anywhere given the Depression. The Alto Adige wine industry collapsed except for rather limited production for local consumption. The valley floors were taken over with more profitable apple orchards; vines grew only on the steeper hillsides. When DOC regulations were instituted in the 1960s, the lines were drawn to reflect this history. Wine grapes were limited to the hillsides, where quality was generally higher, and apples ruled the valley floors, crowding out vineyards there. Apples were still more profitable than grapes in the 1960s, so the DOC lines reflected local economic reality. Vineyards today occupy about 5300 hectares (13,000 acres), half of the peak level and, as noted above, they are fragmented into tiny plots of surprisingly high value. The limited vineyard area combined with the success of the cooperatives and wine estates makes these small plots some of the most valuable vineyards on earth — second only to those in Champagne, one winery owner told me. When the tiny vineyards change hands so do hundreds of thousands of euro. Wow! This is not to say that all the wine made in Alto Adige is of the highest quality. I would say that the majority of the production of the cooperatives is still simple low cost Schiava — these easy-to-identify pergola-trained vines are everywhere. But the trend is clearly up and — unlike the worst of the wineries elsewhere — there seems to be a local market for even the most modest bottlings. What lessons can the successful cooperatives of Alto Adige provide for the struggling cooperatives elsewhere in Europe — the ones who have produced the lake of surplus wine and who are threatened by EU reforms on the wine hand and New World competition on the other? I would like to say that it’s really simple — just adopt the sort of incentive structure that these Italian cooperatives have used so successfully. This is good advice and perhaps a place to start, but I do not think it is as simple as that. We used to talk about Path Dependency in economics. Path Dependency is the theory that “you can’t get there from here.” The road ahead depends on the path you have already taken. It may not be possible to backtrack on the road that Europe’s unhappy family of cooperatives have taken, which has left many of them dependent upon subsidies and crisis distillation. My working hypothesis is that Alto Adige’s unique history (and geography, too) put them in a position that allowed them to succeed (or forced them to do so?). The “unhappy family” cooperatives may not be able to transform themselves, but rather may be victims of their own history. Perhaps, like the Prunotto case, their future lies in private ownership. The photos I have inserted in this post show the contrasts we found in Alto Adige cooperatives and wine estates. Very good post, Mike. It’s an accurate and perceptive description of Alto Adige’s wine industry, and the special case of wine cooperatives. You’re right to point to Alto Adige’s wine co-ops as some of the world’s few that are successful in business and quality. One of the other regions that has a similar scenario is the Wuerttemberg region of Germany, that has a similar split between co-op wineries (about 75%) and private estate wineries (about 25%). There, it may be a little more difficult to find standout quality wines at a co-op, but you still can. 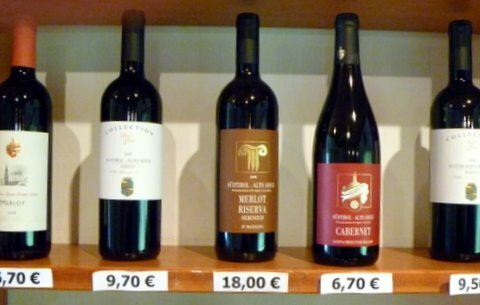 The co-op wineries I visited in southern France made no pretense about aspiring to any great level of quality, but that was just a small sampling. Still, my sense was that you avoided them except if you were on an extremely tight budget. Thanks for this, Tilman. My experience in the south of France is the same as yours, including the small sample size problem. Thanks again.